As a nursery, parents place their trust in you to provide care and attention for their child. Your role is an important one, with evidence that early years education is critical in the development of children. This means not only providing a safe and caring environment, but one that nurtures and educates, creating an ethos that encourages children, irrespective of their likes and dislikes or ability. Learning is to improve understanding and knowledge. Learning activities tend to be associated with the ‘academic’ and yet, research suggests that encouraging physical activity is just as important. As a nursery, as well as separate physical activity sessions, you could improve learning by encouraging children to be active as they learn. In other words, encourage children to stand and move around at the sandpit or messy play table, rather than providing chairs. Try screening off small areas so that children have a cosy, comfortable and flexible area to suit them. Not everyone thrives in a large, open, noisy space. Try not to create ‘running tracks’ down the middle of rooms and consider neutral decoration, with different textures on the floor, such as rugs and cushions. It is tempting to assume that a mound of toys will keep children active and learning for hours but this is not the case. The fewer toys, the more interaction and engagement there is. This is all about focus as much as it is exploration. ‘Packaged’ toys have their place but consider using resources that are open ended, and require imagination to develop into something else. Have you noticed that some children will favour some places over and above others? Or that some children will congregate in places others won’t? This dead space may look inviting to you, but from the child’s perspective could be the opposite of attractive! That means getting down to their level in terms of height, and trying to see what they see from their perspective. Are those tall cabinets overbearing, towering above them? Does it feel cold or cut off from the rest of the space or room? How could it be improved? Why not ask the children? Reading is key in a child’s development and yet, nurseries display their books as in a library with the spine facing outwards. Children don’t select their books in this way. They need to see attractive images and words they recognise thus, investing in shelving with book covers facing outwards can help a reluctant reader explore books and comics, as well as encourage the avid reader to find out more. 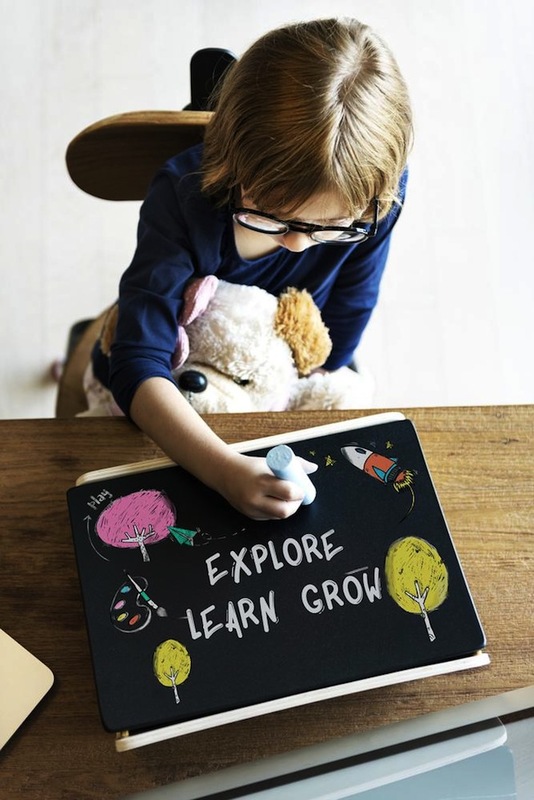 Consider what nursery learning resources you have and what you need to invest in. This means feeling the grass beneath their bare feet or the roughness of sand on the palms of their hands. It means reading a book outside in the shade of the tree, and listening to the sounds that surround us. Don’t assume that ‘real learning’ only happens inside, and as part of organised activities. With health and safety being of such concern, we have changed the ‘how, where, when, why and what’ of learning through play. As adults, we want to keep children safe but maybe we have done so at the expense of the natural instinct of a child to explore. We want to stimulate them and encourage them to learn but in that process, we clutter their environment with bright plastic tables, tubs, chairs and more. De-clutter the learning space, harness the power and calmness of the outside environment and allow children to explore, safely. As an English teacher I totally agree about children needing to see the whole cover of the book ton engage their attention. Really important. This is some great advice. We have taken a lot from Nursery and implemented at home to bring on my son more (delays) and working together, he is coming along speedily. I am really interested by your idea to display books with the cover facing outwards. My sister always just leaves books in piles on the shelf for her little boy- so I guess he is seeing the covers when he looks through them. We are going to start looking at nurserys soon, so I will keep all of these in mind. I agree that it is better to give children a small amount of toys so they can explore them properly! these are actually great ideas! even to implement some at home too. i never went to nursery but don’t think ive missed out on a lot?